CCMC provides both mission science and space weather support through its Runs on Request service, and also through real-time runs and data viewable via webpages and the integrated Space Weather Analysis system (iSWA, iSWA catalog description, API access). 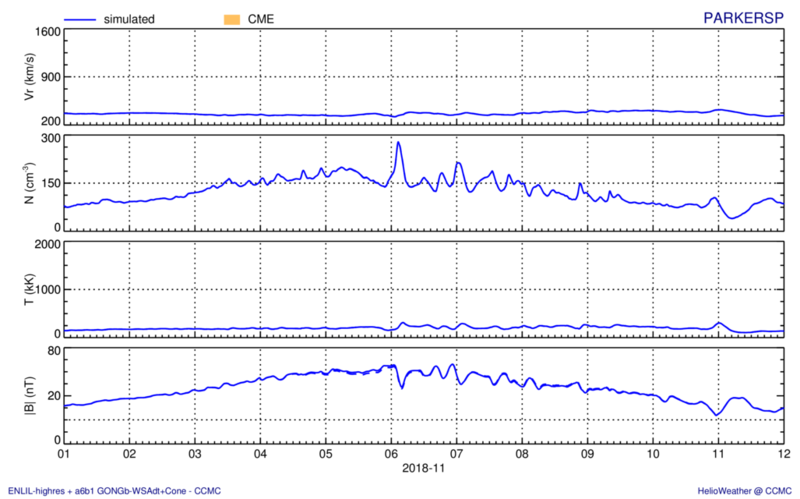 CCMC also provides a searchable database (DONKI, API access) of space weather events, simulations, and notifications. NASA mission users who are subscribed to the notification mailing list: Instructions on how to change your subscription for specific space weather activity types. ▻ Archive (iSWA) of real-time CTIPe electron density and ion temperature along the orbits of: ISS, CALIPSO, and FASTSAT. ▻ Archive (iSWA) of real-time TEC models (SWACI, PBMOD, CTIPe). ▻ Webpage archive of NAIRAS model of atmospheric effective radiation dose rates. ▻ Archive (iSWA) of simulations performed in support of THEMIS at the CCMC. ▻ Retrospective WSA-ENLIL+Cone CME simulation during PSP first perihelion pass (20181101-20181112). ▻ Archive (iSWA) of daily WSA, ENLIL and PFSS model runs at the CCMC. ▻ Archive (iSWA) of simulations performed for the CASSINI Spring 2013 auroral campaign (period: April 1 - May 25, 2013). ▻ Layout to help assess favorable launch conditions: Real-time ACE data, WSA-ENLIL, SWMF, and Ovation Prime simulations. Real-time DSCOVR, ACE and Wind in-situ plasma and magnetic field data. ▻ Archive (iSWA) of real-time WSA-ENLIL+Cone CME and WSA-ENLIL background simulations which can be compared with VEX data.